In the latest of our Goofs on the Roof series, Mat Woodyatt of BMI Redland, looks at concerns regarding clay tile delamination. The quality of raw materials and the manufacturing process largely determine how prone clay roof tiles are to the defects of surface spalling and delamination – the bane of clay roof tiles. Lamination is where you have weakly connected layers of material within the body of the clay. When those tile layers begin to separate, you have delamination. It is found in all clay products but is more prevalent in poorly mixed and/ or sourced raw materials. Avoiding delamination is a solid argument for choosing both high quality clay and manufacturing credentials when selecting a clay plain tile for the roof. After all, a clay plain tile roof – at 60 tiles per m2, laid at a broken bond and double lap – is the one of the most expensive and complex systems a customer may choose for a roof. Why then skimp on the materials? The death knell for the roof is if and when tiles do start to delaminate. It occurs when water, absorbed into the slate or tile during the winter, freezes and expands, causing the fired clay mineral layers to separate and ultimately flake off. If you can see tiles delaminating on the surface, then chances are that under the lap – where the surface is darker and damper – you will find even more. At best and at least, it is a partial strip and re-roof as, at this point, the delamination is only going one way – and that is towards complete roof failure. Not to mention that the debris falling down the roof obstructing the free flow of water off it. The thing we absolutely should not do when the first signs of delamination appear in the roof is help it along! The image shows an old clay roof that had been beleaguered with moss and dirt. As the moss fell away, it was blocking the gutters and – as nobody likes having to get up there to clean them – a contractor was called in to deal with the problem. A quick wash and a brush later the moss was gone and the roof looking very clean: yet very, very broken. The removal of the moss had helped drag away the surface material of the tile, and now the failure of the roof covering was well underway. 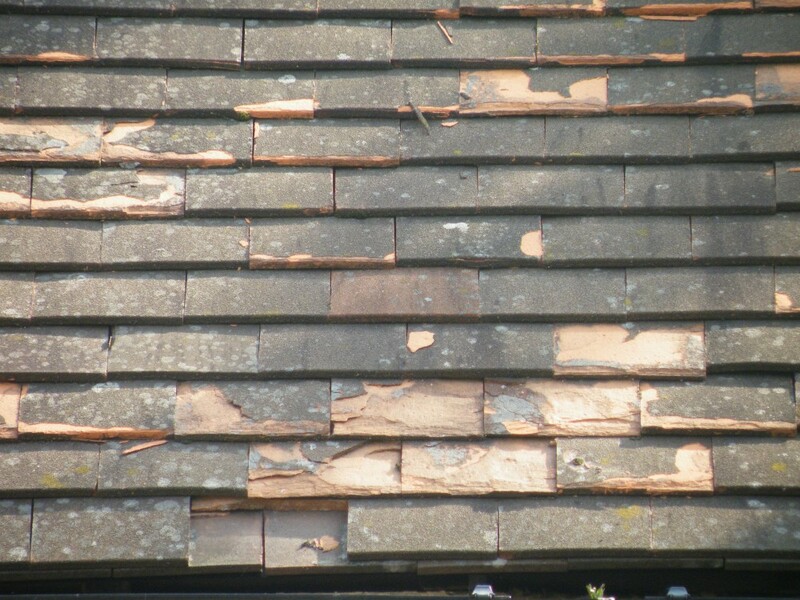 Care should be taken when making any alterations to the surface of the roof covering, especially when dealing with an ageing roof. Often attempts to carry out superficial repairs can result in bigger problems. The main issue here was that the customer was not made aware of the risk to the roof covering and what started out as a maintenance job turned into the prospect of a re-roof. One could of course argue that the damage was already done beneath, and the greater work would need to happen at some point anyway, yet but forewarned is forearmed.